While the health care bill was being hammered out, a different sort of political drama unfolded in Washington at the headquarters of the Environmental Protection Agency, where environmental activists camped out for 32 hours to send a strong message to administrator Lisa Jackson: End mountaintop removal coal mining. The protest didn’t attract many prominent headlines in the shadow of the health care fracas, but like Obama and the Democrats it got the job done. Based on Jackson’s statements on March 8 at the National Press Club, it appears that the EPA is seeking ways to “minimize” the ecological damage of mountaintop mining rather than halt the most extreme strip mining practice. A paper released in January by a dozen leading scientists in the journal Science, however, concluded that mountaintop coal mining is so destructive that the government should stop giving out new permits all together. 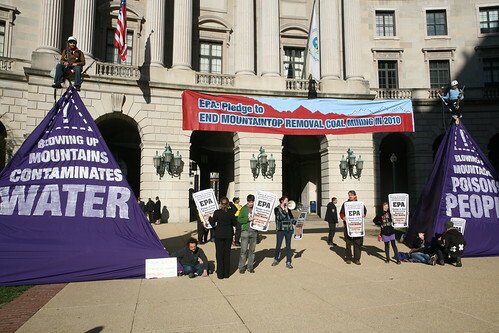 One of the chief goals of the EPA protest, which was organized by the Rainforest Action Network, was to get Jackson to accept a citizen-guided flyover of mountaintop removal sites in Appalachia. We’re still waiting for her to tweet her RSVP. Images by Chris Eichler, courtesy of Rainforest Action Network.